With what many regard as the Ministry of Defence’s less than stellar record in protecting historic Royal Navy wrecks back in the spotlight with the discovery of the intact wreck of HMS Warrior in the Norwegian zone of the North Sea, thePipeLine can reveal that Mr Henk de Bloeme, a Dutch salvage captain and operator of the Panamanian flagged salvage vessel MV Bela, who was fined £2000 and forced to pay a portion of costs after pleading guilty to charge of conducting unlawful salvage operations, at North Tyneside Magistrates’ Court on 29 May 2015, was earlier accused of conducting unauthorised salvage operations on the wreck site of the World War One Royal Navy destroyer, HMS Scott in July 2010. The accusation was made in a letter to the British Embassy in the Hague, sent by a group of Dutch divers and historians who were concerned at the increasing amount of damage being done to historic wrecks off the Dutch coast by the unauthorised salvage, of artefacts and non ferrous metals. Among the vessels alleged to have been targeted are at least three other Royal Navy wrecks which, like HMS Scott, would be classed as maritime military graves. However, while acknowledging the information the British Government, through the British Embassy in the Hague, declined to take any action, citing a legal situation which was not “straight forward”. The Destroyer Leader HMS Scott, built in 1917. The 1800 ton HMS Scott, was a virtually brand new, state of the art destroyer leader, and she either struck a mine, or was torpedoed, and sank on 18 August 1918. At the time she was some twenty miles off the coast of Holland. Twenty two of her crew were killed in the sinking. However thePipeLine understands from experts in Maritime Law that the legal situation was actually relatively simple. If HMS Scott has not been sold for salvage by the UK Government she retains Sovereign Immunity under International Law and the salvage was illegal under Article 4 Section 1 of the IMO Convention on salvage 1989. Effectively the removal of salvage was the theft of British Government property. Under International Law the Dutch Government and the Panamanian Government have a duty to uphold the concept of Sovereign Immunity, as does the UK Government. However, if the wreck has been sold to a third party and Mr de Bloeme held no valid salvage permission or contract for the wreck, the salvage can be dealt with under the 1989 International Convention on Salvage. 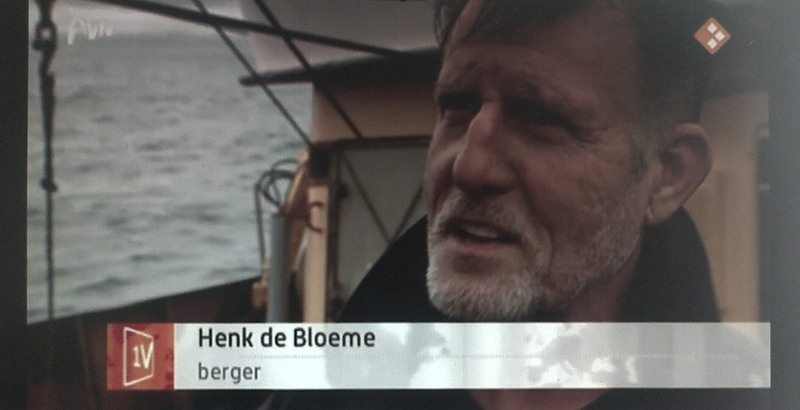 In October 2011 Mr de Bloeme’s salvage activities on Royal Navy warships were also covered in a report on the Dutch television current affairs magazine EénVandaag, where Mr de Bloeme was referred to as “the Cowboy of the North Sea”. The Een Vandaag report included allegations that Mr de Bloeme and MV Bela had also salvaged material from the three British cruisers HMS Cressy, HMS Hogue and HMS Aboukir, sunk on 22 September 1914 by the German submarine U9, with the loss of 1459 lives, mostly reservists. In that case the jurisdiction was complicated by the fact that the British Government sold the three wrecks for salvage in 1954. Although her card had clearly been marked, it is not possible to state whether the seven hundred ton MV Bela was deliberately targeted by the Marine Management Organisation [MMO] when she began operating in UK waters in the Summer of 2013. However, this is thought likely as the Government press release announcing the details of the case states that MV Bela left Holland on 15 July 2013 and visited several wrecks before being intercepted and boarded by HMS Severn, a patrol vessel of the Fisheries Protection Squadron, on 1 August 2013. Maritime sources suggest that, given the Fisheries Protection Squadron consists of just four vessels, it is unlikely HMS Severn would have simply stumbled across the Bela while on a routine patrol. Found on board the Bela were tin ingots worth at least £50,000, which had been recovered from the steamer Cheerful which sank off the north coast of Cornwall in 1885. Mr de Bloeme did not have a licence to conduct the salvage from the UK Marine Management Organisation. On 20 May 2016 a UK based salvage consultant, Mr Neil Isherwood, was sentenced to a Community Order of 150 hours of unpaid work in relation to the same case. thePipeLine understands that Mr Isherwood intends to appeal and there is no evidence that he has been involved in the illicit salvage of Royal Navy vessels. thePipeLine e-mailed Henk de Bloeme asking him to comment on the allegations of illicit salvage from HMS Scott and other vessels, but so far we have received no reply.